One of the oldest bridges in the wider Dunedin area, and the main link between Hyde and Macraes, the Hyde Bridge has undergone extensive repair work. The $407,000 project, including the replacement of the bridge’s deck while the contractors are there was a 3 month project and undertaken by Alexandra based Breen Construction. Our Timber Consultants worked closely with the civil engineer, Breen Construction and our local Approved Reseller to come up with a unique solution to a difficult project. 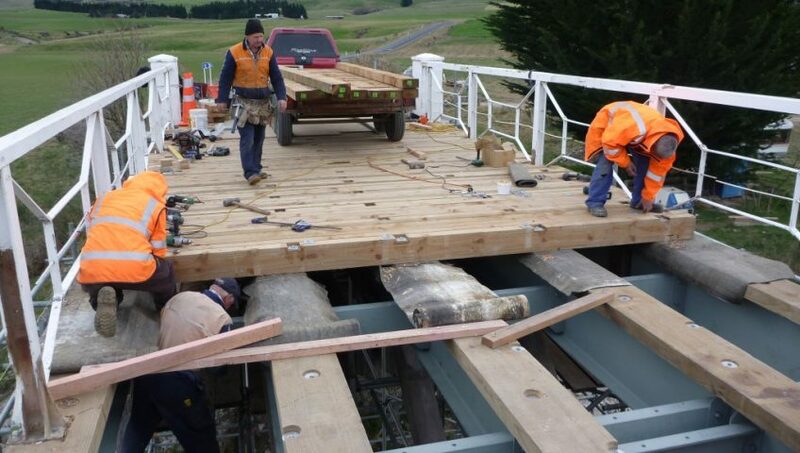 Trusted Weka SG8 timber was used to baulks as the picture shows – laid on edge and bolted together, to achieve maximum strength and stiffness for this vehicle bridge. The bridge over the Taieri River on the Hyde-Macraes Road was built in 1879. The bridge was constructed as the result of community agitation; the Taieri River could be dangerous in flood, and the upper Taieri area was isolated. The bridge provided safe crossing and a stable connection with the outside communities. The bridge is a testament to the design and work of the County Engineer Robert Browne. The bridge has an iron lattice truss for the main span and short timber arch trusses at either end. The piers and abutments are stone. It was adapted to the site by the addition of a 30 ft (9.1m) span at each end, to give a total length of 160ft (48.7m). The deck is 30 ft (9.1m) above water level, and it has a load limit of 609 tonnes. The bridge remains a notable landmark on the Strath Taieri.